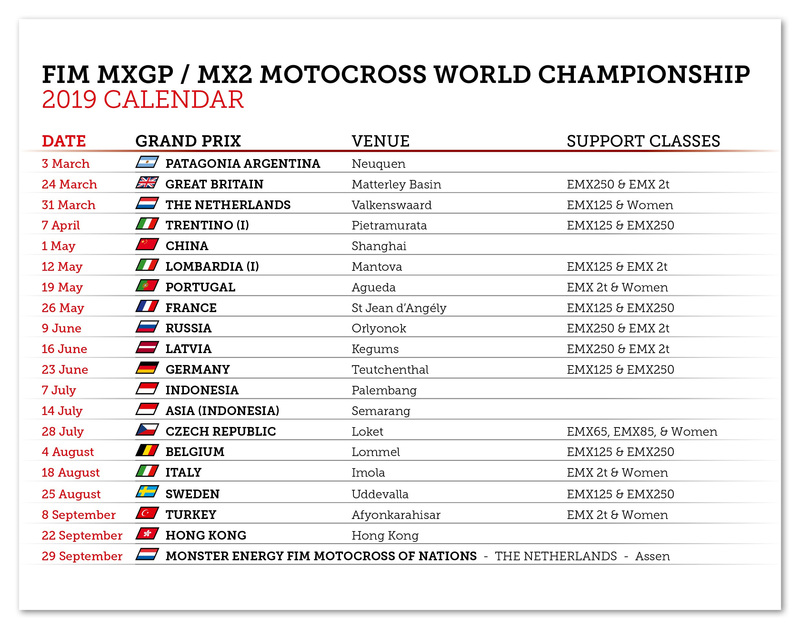 With the 2019 MXGP Season on the horizon Youthstream announces a revised calendar for the FIM Motocross World Championship which will start on March the 2nd and the 3rd at the beautiful Patagonia-Argentina Circuit of Neuquen. Firstly, the MXGP of Switzerland anticipated for August has been cancelled and is instead working to return to the calendar in the 2020 season. Following the removal of Switzerland, the MXGP of Italy in Imola will now be held on the 17th and 18th of August instead of the 21st and 22nd of September. Meanwhile the MXGP of Hong Kong will move from the 20th and 21st of April to the now available 21st and 22nd of September as per the local organization request. The new timing will bring racing back to Imola after an impressive inaugural event in 2018 and will also provide Hong Kong with additional time to prepare for its first ever MXGP event. In addition to the rescheduling of the rounds mentioned above the venue for the 2019 MXGP of Lombardia on May 12th is announced as Mantova which was last visited during the 2016 FIM Motocross World Championship season.